Details of the first Hitman “Elusive Target” have been revealed: His name is Sergei Larin, he's a forger, and you've got less than 48 hours to ensure his wife needs to buy a suitably sombre new black dress. Don't feel too bad about his grieving widow, though. Based on the Elusive Target trailer released today, she's the one who wants him dead, or at the very least wants to be sure she has a rock-solid alibi when the deed gets done. Larin's location wasn't known when the job was first announced, but it turns out he'll be in Paris over the weekend, which is your window—your only window—to do the job. The Elusive Target timer began at 9 am PDT/12 pm EDT today, and will run for precisely 48 hours. If Larin is still alive when the timer hits zero, you're done. If you get killed, you're done. If the target gets away, you're done. If you botch the job and end up having to massacre dozens of innocent bystanders... well, that's okay, as long as Larin gets dead in the process. Elusive Targets are particularly tough to nail because they don't appear on the mini-map or instinct, and you can't save your progress along the way. 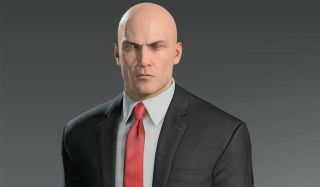 But with risk comes reward: Taking out five of them will get you the “signature suit” from Hitman: Absolution, while killing ten will earn the suit from Hitman: Blood Money.